As a premier skilled nursing facility in beautiful Bessemer, Alabama, Terrace Oaks Care and Rehabilitation Center provide compassionate and personal skilled care 24 hours a day. We specialize in providing rehabilitation services onsite to help our residents regain their independence and return to their homes. If you’ve had a fall, stroke, hip/knee replacement or heart attack (or live with a chronic illness), you know how important 24-hour care can be. Skilled nursing has long been the gold standard for high-quality health care services. Often the transition to a skilled nursing facility is challenging. At Terrace Oaks Care and Rehabilitation Center, we strive to ease the process by providing an environment where residents and guests feel informed and comfortable. 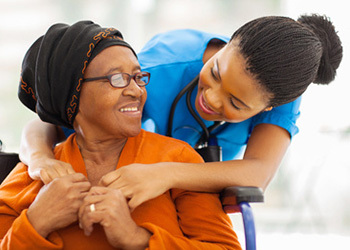 Our staff of nurses are always available to answer questions and lend a hand, each resident is paired with a coordinator, to help ease the transition and provide a familiar smiling face.